GAWMiners, an official Gridseed Scrypt ASIC partner, has announced an interesting promotion for – the company will double their customers’ mining profits for 7 days starting on April 26th. 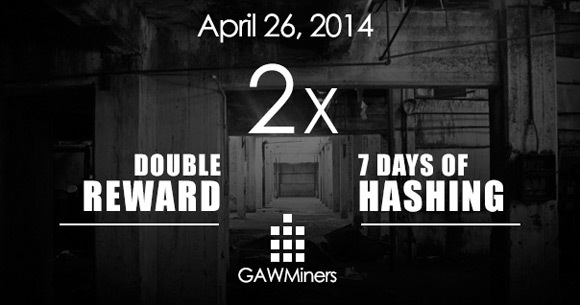 The Double Your Hash promotion is available to all customers who have purchased mining hardware from GAWMiners on or before April 25, 2014. The payout for the promotion will be based on the Litecoin mining difficulty and market price during the 7 days of the promotion. Customers will be paid the equivalent of what their purchased hashing power earns them. – Only customers of GAWMiners.com are eligible to participate. – Customers must register on the website to participate in the promotion. Is volt modded hash rate permitted? If I purchased 5 miners from them do I point 1500 KH/s, 1750 KH/s or 2500 KH/s in their direction and stay withing the rules? It’s not mentioned on their web site that I can see. It would be annoying to point the full 2500 KH/s at them and later they come back and say you only bought 1500 KH/s. Miner, well it should be the one you have purchased according to the hashrate of the listing of the product(s) you bought, so for a single miner that should be 300 KHS as per the item listing description. They did not sell you overclocked product or voltmoded and overclocked one right. Thanks admin. GAW Miners had some great promos last week. Definitely worth checking them first if looking for more Gridseeds. I thought it was a pool based promo…… oops! I’ve re-read your post and it looks like a straight give-away type event. That is a bonus. Thanks for posting it as I might have missed out otherwise.